For a time such As this! Glory Be To God!!! This dear friends is my sister in Christ that crossed my path many years ago. She encouraged me from the beginning of my journey before even being called into the ministry myself,with faith that never wavered I might add! We even have a site we compiled together.I am over joyed with sharing this wonderful testimony of My Sis Ethel and I know it surely will build up faith in many as she journeys to fulfill the calling God has on her life. I pray that you will remember her in your prayers for each and every place she goes to win for God many souls! I love you Sis Ethel and there isn't words I could say to relay the joy I feel today,I just want to shout it off the roof top of how Good is Our God!! Faithful and true,your testimony will ignite and usher in the kingdom of God!! Greetings to the Household of Faith! I greet you in the name of Jesus! My name is Evang. 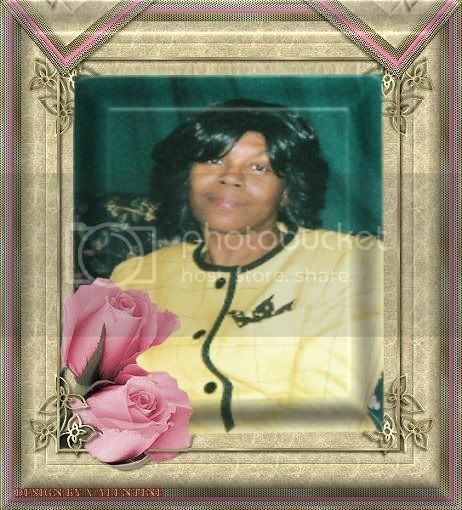 Ethel L. Buchanan, and I am founder of God's End Time Evangelistic Ministries, and a member of the Last Days Apostolic Church in St. Louis, MO; pastored by District Elder Arthur R. Johnson. My spiritual resume' is enclosed with this letter. The Lord has given me a testimony to share with the world and the Lord has shown me that this testimony will bring glory to Him, and benefit many, many people in body and soul. As my resume' states, the Lord saved me in January of 1976, and I was called to preach the gospel of Jesus in 1981. I became angry with God over the outcome of my marriage and I backslid out of the will of God in 1993. I allowed the devil to deceive me and proceeded on a downward spiral into a promiscuous lifestyle on crack cocaine for the next 4 years. In 1994, I moved to Louisiana, thinking I could "get a fresh start" there, but if holiness doesn't go before you, then your sins will follow you. Finally, in October of 1997, I became tired of being tired of the life I was living, and the Lord delivered me in one night from crack cocaine, with no rehab or 12 step program. All it took was my godly repentance and the knowledge that God still loved me and forgave me, and I came running back to the Lord. During that time; I met someone whom I thought I would someday marry, and over a 10 year period of talking and seeing each other every day; it still turned out not to be God's will. In January of 2005, I found out that I had contracted the AIDS virus, and I began a journey in mind and spirit that was mentally, emotionally and physically painful, exhausting, stressful and very lonely. During the past 3½ years, I have endured hundreds of shots, many hospital stays for flu, dehydration and minor surgeries, 2 strokes, and 21 medications twice a day for an assortment of illnesses that came about in relation to AIDS. As I spoke with my spiritual parents in Louisiana, Apostle Alfred Showers and his wife Elect Lady Sopheia Showers, of Showers of Blessing Deliverance Temple, they encouraged me, prayed with me, and never stopped believing God with me, and it's important to have someone touching and agreeing with you for what you know God is going to do. I moved back to St. Louis in January of 2006, after the Lord showed me that I would not be blessed until I returned to my first works and being obedient to God, I reinstated my membership at Last Days Apostolic Church. During these past 2½ yrs, the Lord has brought me through much, shown me much, and developed my ministry much. My prayer and study life has increased by leaps and bounds, and my love for the work of God and the people of God knows no end. Whatever my hands have found to do, I have done. There have been many times when I wasn't able to do what I desired, due to health problems, but the Lord and my church family in Missouri and Louisiana, kept me encouraged and determined to do His will, and allow Him to have His way in my life. I was met with whispers, pitiful looks, stares, doubt and even criticism on every hand from some family members, friends, and foes, even people of God who said they were believing God with me. to pass for you because of your faithfulness, because you trust Him, and for His glory that others may benefit from your healing. Whatever you have to do, be back here tonight". Well, I had stopped taking all my medications a month previous, because I felt led of the Lord to stop. So there was no medication in my system at all. I went to my sons' house after the seminar and was so excited, his girlfriend asked what I was so excited about; I told her and before time for service, they had talked to a friend of theirs, and they all went to the service with me that night. My son had not been to church in many years... Service began at 7:30, we got there at 6:30 to get a seat. The service was being recorded on DVD that night, and we were all totally enjoying the move of God in the service; and at midnight (I'm not joking, it was actually midnight), the prophet of God had a Bishop call me up to the pulpit. He began to minister some things to me privately, then 4 times he passed his hands in front of me, standing several feet away. The power and anointing and PURE GLORY of God fell on me so that I couldn't stand, I couldn't speak. I sank to the floor, legs feeling like jelly, my body feeling like rain was pouring over me, from the inside out. 4 times the prophet told the helpers to stand me back up. The fourth time, he approached me and laid his hands on my stomach, and cried out "Thou foul demon of disease, come out of her in the name of Jesus". I felt like something was snatching and ripping everything inside my body out, and twisting it as it pulled it's way out. I was slain in the spirit for quite some time, and when I got up, I stumbled my way to the ladies room with help, and began to vomit every color in the rainbow, all manner of everything, until I was slain in the spirit again. I made an appointment with my doctor to have a complete battery of lab tests done, and the tests that were done 3 times show that there is NO SIGN of AIDS in my body whatsoever, that I am as healthy as anyone can be. My doctors don't understand it, but I know it was the power of God, the promise of God, the manifestation of my healing; the healing virtue flowed through my body. My son and his girlfriend and friends are experiencing a yearning, a hunger for God's will in their life now, they are ready to get married and their friend experienced the move of God as the anointing fell on him, he fell to the floor. Throughout this journey, I have come to know the love, grace (favor) and mercy of God, the true meaning of faith in the Lord, no matter how it looks, pressing toward the mark, and enduring to the end. I've received telephone and email requests from different groups and churches asking me to come and minister what God has done for me, from as far away as South Africa and the Philippines; I've been asked to appear on TBN and the Preach the Word Network. On the other hand, I've been told by some, that I shouldn't tell my testimony, or that perhaps I should only tell part of it, but don't say that it was AIDS that I was healed of; they feel that people will "look" at me differently, shun me, or just won't understand, and that all people will think about when I stand to preach is "oh, she's the one that had AIDS"....To that, I say this: "Let every man be a liar, and let God's Word be true. I fear NOT what man may do, or say, or think, because I'm going bound in the spirit, with a charge to keep and a God to glorify." I wasn't ashamed for people to see me as a backslidden minister, doing what I wanted to do against God's will; and when the Lord reclaimed me, I started running even harder for Jesus than I did for the devil; guiding souls to the cross; so now that the Lord has healed my body, I'm not ashamed to tell the WORLD that God healed me of AIDS, not just "a disease", but AIDS!!!. The Lord also has shown me through dealing with people on this journey, that it does not matter what people think of me, but it matters what God thinks of me. As long as I'm doing the will of Him that saved me, sent me and healed me, that's all that matters to me. My LIFE must glorify God. Through this journey I've come to realize what it means to have patience, and to know that this was not about me, and that was the hardest part to learn. I sought the Lord and He heard my cry and delivered me from all my sins and diseases, brought me out of an horrible pit,established my goings; and my ministry now is to travel and tell the world that He can do the same for them. "If you are a soldier in God's Army, don't give God instructions, just report for duty"